I kept seeing so many reviews for this product and I though to myself does this really work? What does it taste like? Is it going to be any good? I wanted to try it. When it arrived I was so excited. I kinda might have squealed a little. Just a little. :) I tore into the package after I lugged inside. It was a lot heavier than I expected. I didn't take into account everything that was inside. Wow, huh? Yea. I kinda didn't know what to do first. It all sounded good. But I was still skeptical. How was this going to taste? So I decided to fix the Root Beer first. ♥ Root Beer. I was a little nervous about making it. Even though the company said it was easy to make. It really was easy though! All you have to do is fill one of the carbonating bottles with cold water to the fill line. Screw it into the soda maker. Push the carbonation button on the top (it says 3 times, but the more you push the more carbonation in the soda - I usually went with 5. I like it bubbly.) Unscrew from soda maker. And add the flavoring. Then it was time to do a taste test. Slowly, I took a small sip. Not bad. Now a bigger drink. Hmmm, it was very tasty. I was surprised. I really didn't know what I was getting into. I will say this. It is not going to taste exactly like your regular pops (I say pop not soda...it's a southern thing). It's not as carbonated. But it is very flavorful and it really can cut down on the amount of money you spend on your pop. It might take you a little while to get used to but I liked it. Now you can also do flavored water. But I really didn't care for the taste of that. You however may not mind it. It's all a matter of preference I think. The nutritional value is beneficial as well. It has less calories then regular pop. Regular flavors contain no high-fructose corn syrup, and diet flavors are sweetened with Splenda® brand sweetener, not aspartame. 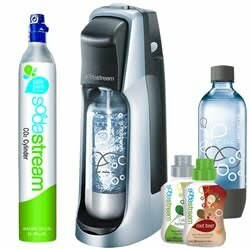 SodaStream is also earth-friendly and convenient. I would definitely recommend this to anyone who wants an alternative to regular soda.